The monitoring of rain water in some places in the United States is now turning up some radioactivity. Below are some links to various articles about it. The Daily Mail – Poison particles from nuke plant found in AT LEAST 12 US States as Japan is put on ‘Maximum’ radiation alert. 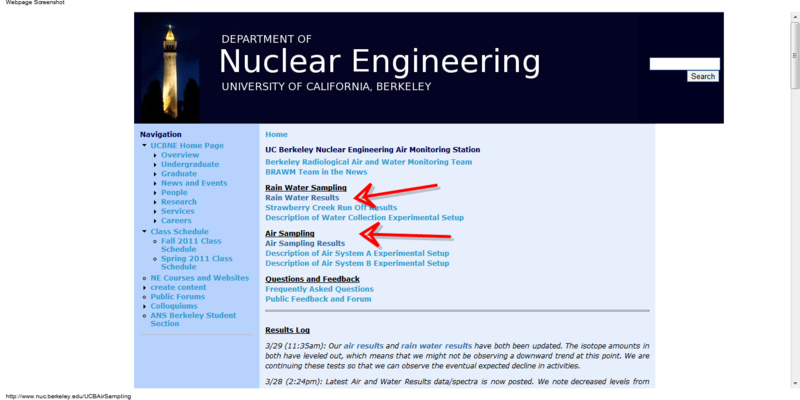 If you want a good idea of what kind of radiation is blowing into Northern California from the nuclear power plant meltdown in Japan caused by the recent earthquake and tsunami, you can go to the UC Berkeley Department of Nuclear Engineering website for your daily update on what kind of dose you’re getting. They are also monitoring rainwater. Click on the source below and it will take you there. If you go to their Frequently Asked Questions page there are links to two other monitors and other important information such as the half-life of various isotopes. The Japanese earthquake, tsunami which have been followed by massive problems have much of the world now concerned about radiation doses. 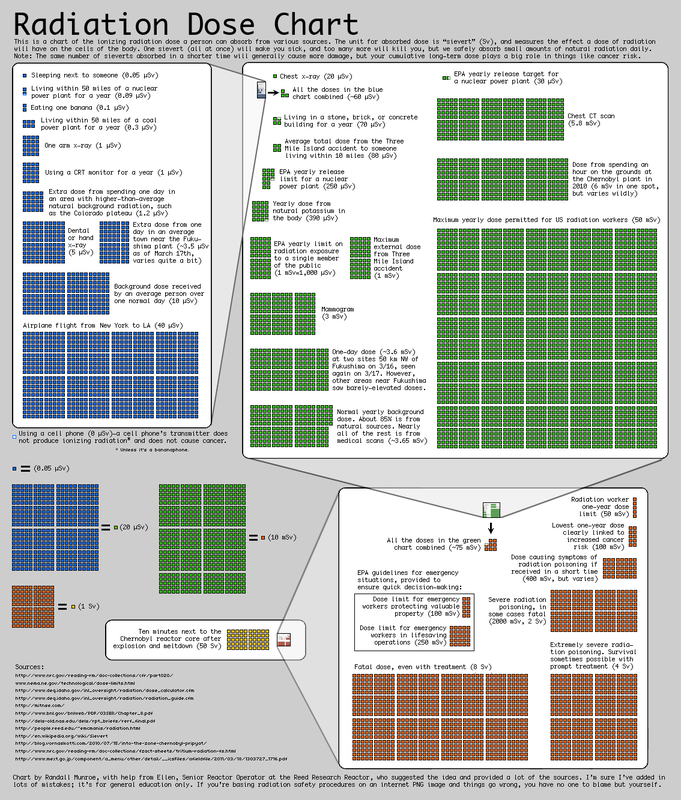 Here is a radiation dose chart courtesy of Canada Free Press who deserve a Hat Tip. Click on it to make it larger. A U.S. geologist and British astrophysicist warn the Earth is now entering a heightened period of seismic activity that may trigger earthquakes. Two prominent experts hold the view that earthquakes are not random events and may now be predicted in advance due to increasing sophistication in observational and predictive techniques. Berkland, a former USGS Geologist, warns that we are seeing a coincidence of several natural phenomena including the closest approach of the moon since 1992, plus a full moon coinciding with the equinoxal tide. He warns that this convergence of three of the most important tide raising factors is a “seismic window” of additional stresses on the Earth’s crust that may trigger quakes. Berkland suggests that in this top seismic window in years, the west coast of the United States is a high risk area. Piers Corbyn is less specific on the location but believes the time of highest risk is in the five day period of 23th to the 27th March. Both experts emphasize the enormous power and influence that the sun and moon have on our planet. Such forces impact us in terms of both geological activity and Earth’s climate. According to Corbyn it was the ‘X Class’ solar flare of March 10, 2011 that caused a significant hit on the Earth by a coronal mass ejection, which was reported by NASA. He says this, in turn, triggered the massive Japan super quake (M=9.0) the following day. The most earthquake and tsunami prone region on Earth is known as the Pacific Ring of Fire. Around 80 percent of the world’s earthquakes occur around this volatile region that circles the Pacific Ocean (National Geographic). It is here where plate tectonic movements of the continents generate enormous stresses on the planet’s crust. This build up of stress at the plate boundary causes rock to fracture; the plates grind past each other and the energy is suddenly released in the form of an earthquake. Please read the rest at the source below. Chernobyl today is being reclaimed by nature. Radiation experts studying Chernobyl meltdown confirm no long-term risks posed at Fukushima despite media hype over the nuclear disaster. Nature copes well, they found. Last week the world’s media focused attention on the ‘Fukushima 50’- those brave workers exposed to radiation contamination as they clean up after the explosion at Fukushima’s nuclear plant. We examine the health risks posed from radiation poisoning by such a disaster based on a unique 12-year scientific study at Chernobyl; conclusions that show just how well the natural environment has fared a quarter of a century on from the world’s worst nuclear disaster. Two top radiation experts, Professors Ronald K. Chesser and Robert J. Baker, in creating their joint study, ‘Growing Up with Chernobyl’ painstakingly studied and measured the true aftermath of Chernobyl. These world leading radiation experts present an astonishing new insight that no only shows how robust nature really is, but also exposes the extreme anti-science bias that for decades has ramped up unproven fears about the dangers of nuclear power. I felt compelled to write this article in light of the media’s scant concern over Japan’s worst earthquake and tsunami that took over 10,000 lives. Despite the still unfolding tragedy from the earthquake and tsunami, the world media has instead chosen to focus on a nuclear accident where no one is reported killed from radiation science proves the outcome is likely to less terrible than is being portrayed. I find I’m not alone in thinking that the world’s press has its priorities skewed and needs to take another hard look at the science. In this regard I want to draw readers’ attention to ‘Growing Up with Chernobyl’, a study that will help provide some comfort to the people of Japan and which demonstrates a positive legacy from Chernobyl; a place where nature has shown a remarkable propensity not only to bounce back, but to provide a rich new bounty. Frankly, no one can look at TV broadcasts depicting the heroics of the ‘Fukushima 50’ and not feel desperately sad for the future health prospects of the clean up workers who may face radiation sickness and the associated cancerous consequences. But what is infuriating is that we can conclude from those images that to the media the tsunami and earthquake weren’t “bad enough” to hold their attention despite the ongoing crisis for Japan’s population with ever-increasing suffering due to starvation and hypothermia. No, the focus is all nuclear now. As Christopher Booker cogently reports in The Daily Telegraph (March 19, 2011) eco-propagandists have been hard at work drumming up fears of a nuclear disaster for Japan “worse than Chernobyl.” But if we look at the science and not the media frenzy then there truly is no prospect of any such catastrophe to match the unprecedented meltdown at Chernobyl’s Reactor IV on April 26, 1986. 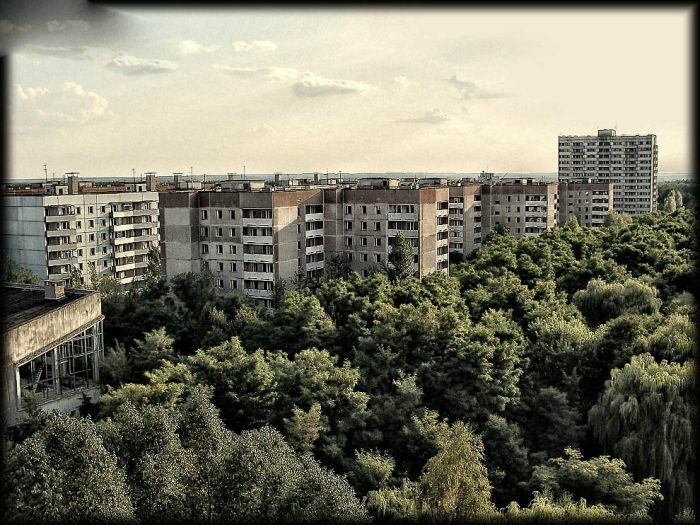 Nonetheless, that green urban legend about Chernobyl killing “millions” still survives. However, two undaunted professors, academic researchers skilled in radiation contamination, have collected all the facts to squash that fallacy after spending 12 long years painstakingly probing the aftermath of Chernobyl. As with their fellow scientists battling to overcome the hysteria over global warming, Chesser and Baker have had to contend with an endless tide of green propaganda and censorship. In their quest for real science the pair admit they learned “tough lessons about politics, bias and the challenges of doing good science” on this similarly polemicized issue. Chesser is a professor of biological sciences and director of the Center for Environmental Radiation Studies at Texas Tech University. Much of his current research is in reverse-engineering radioactive releases from nuclear accidents. He continues to work at Chernobyl and is currently examining the radioactive contamination and human health issues surrounding nuclear facilities near Baghdad, Iraq. Robert J. Baker is Horn Professor of Biological Sciences Research at Texas Tech and affirmed world-leading research scientist. His research program evaluates molecular variations in organisms exposed to Chernobyl radiation. After the initial decline of the animal populations, which were decimated by radioactive fallout, local wildlife is now thriving. The two were completely taken aback by the lack of evidence for any genetic mutations, as had been the expectation of most theorists. Thus it seems, radiation is more quickly dispersed in nature than previous estimates had thought. The preponderance of such rich diversity of life has forced scientists to conclude that this so-called “dead zone” has effectively become a fertile natural preserve. Despite these incredible findings being published in the prominent American Scientist Journal (Volume 94) this was not the kind of science that broadcasters wanted to show us. What they saw, just as with the great global warming debate, a propaganda war is constantly in play; ‘Big Green’ still insists on hyping the myth that a million died from Chernobyl when, in fact, independent studies put the actual death toll in the range of 38 to 4,000 (e.g. see the2005 report by the International Atomic Energy Agency). So why are broadcasters stubbornly stuck in the great rush to dismantle our western way of life? Watch Piers Corbyn’s take on earthquakes, tsunamis, nuclear power and weather. Above is a live Geiger counter located in Los Angeles, California, USA that you can watch. If you want to watch it live go here. 60 is considered normal. From what I read there’s not much to get excited about unless it goes over 100. Top nuclear scientists advise that the reactors at Fukushima damaged by a tsunami and quake cannot explode. Situation is contained. Dr Josef Oehmen and a team of faculty and staff have set up an information page at MIT’s Department of Nuclear Science and Engineering (NSE). For those concerned about the dangers at the Japanese nuclear disaster should visit the newly launched MIT NSE Nuclear Information Hub. The earthquake that hit Japan was 5 times more powerful than the worst earthquake the nuclear power plant was built for. (The Richter scale works logarithmically; the difference between the 8.9 quake and an 8.2 quake the plants were built for is not 8.9-8.2= 0.7. It is 5-fold.) So, the first hooray for Japanese engineering… everything held up. When the earthquake hit the nuclear reactors all went into automatic shutdown. Within seconds after the control rods had been inserted into the core and nuclear chain reaction of the uranium stopped. Now, the cooling system had to carry away the residual heat. The residual heat load is about 3% of the heat load under normal operating conditions. The earthquake destroyed the external power supply of the nuclear reactor. Then the tsunami came much bigger than people had expected when building the power plant. The tsunami took out all sets of backup diesel generators. When designing a nuclear power plant, engineers follow a philosophy called “Defense of Depth”. That means you build everything to withstand the worst catastrophe you can imagine. Then you design the plant in such a way that it can still handle one system failure (that you thought could never happen) after the other. A tsunami taking out all backup power in one swift strike is such a scenario. The last line of defense is putting everything into the third containment which will keep everything, whatever the mess (control rods in or out, core molten or not) inside the reactor. When the diesel generators were gone, the reactor operators switched to emergency battery power. The batteries were designed as one of the backups to the backups, to provide power for cooling the core for 8 hours. And they did. Within the 8 hours, another power source had to be found and connected to the power plant. The power grid was down due to the earthquake. The diesel generators were destroyed by the tsunami. Mobile diesel generators were trucked in. This is where things started to go seriously wrong. The external power generators could not be connected to the power plant (the plugs did not fit). After the batteries ran out, the residual heat could not be carried away any more. At this point the plant operators begin to follow emergency procedures for a “loss-of-cooling event”. This is the next step along the “Depth of Defense” path. The power to the cooling system should never have failed completely, but it did, so they “retreat” to the next line of defense. All of this, however shocking it seems to us, is part of the day-to-day training you go through as an operator, right through to managing a core meltdown. It was at this stage that people started to talk about core meltdown. If cooling cannot be restored the core will eventually melt… after hours or days. The last line of defense, the core catcher and third containment, will come into play. But the goal at this stage was to give the engineers time to fix the cooling systems by managing the heating in the core and keeping the first containment (the Zircaloy tubes containing the nuclear fuel) and second containment (our pressure cooker) intact and operational for as long as possible. Because cooling the core is such a big deal, the reactor has a number of cooling systems, each in multiple versions (the reactor water cleanup system, the decay heat removal, the reactor core isolating cooling, the standby liquid cooling system, and the emergency core cooling system). Which one failed, and when, is not clear at this time. So imagine our pressure cooker on the stove, heat on low, but on. The operators use whatever cooling system capacity they have to get rid of as much heat as possible, but the pressure keeps building up. To maintain integrity of the pressure cooker (the second containment) pressure has to be released from time to time. Because the ability to do that in an emergency is so important, the reactor has 11 pressure release valves. The operators vent steam from time to time to control the pressure. The temperature at this stage was about 550°C. This is when the reports about radiation leakage starting coming in. Venting the steam releases radiation but it is not dangerous. The radioactive nitrogen and noble gases are no threat to human health as they decay in seconds. During venting an explosion took place outside of the third containment (our “last line of defense”) and inside the reactor building. (Remember, the reactor building is not intended to keep radioactivity in… it is to keep weather out.) It is not yet clear what happened, but this is the likely scenario. The operators decided to vent the steam from the pressure vessel– not directly into the environment, but into the space between the third containment and the reactor building (to give the radioactivity in the steam more time to subside). At the high temperature the core had reached, water molecules “disassociate” into oxygen and hydrogen – an explosive mixture. And it did explode, outside the third containment, and damaging the reactor building around it. It was that sort of explosion that caused the Chernobyl disaster, because it happened inside the pressure vessel which was badly designed and not managed properly by the operators. This was never a risk at Fukushima. The problem of hydrogen-oxygen formation is one of the biggies when you design a power plant (if you are not Soviet, that is), so the reactor is built and operated in a way it cannot happen inside the containment. It happened outside. It was not intended, but was OK because it did not pose a risk to the containment. Steam was vented and the pressure was now under control. But if you keep boiling your pot, the water level will keep falling. At the start, he core is covered by several metres of water to allow time to pass (hours, days) before the core gets exposed. Once the rods start to be exposed at the top, the exposed parts will reach the critical temperature of 2200 °C after about 45 minutes. This is when the first containment, the Zircaloy tube, fails. And this started to happen. The cooling could not be restored before there was some damage to the casing of some of the fuel rods. The nuclear material itself was still intact, but the surrounding Zircaloy shell had started melting. What happened next is that some of the byproducts of Uranium decay – radioactive Cesium and Iodine – started to mix with the steam. The big problem, Uranium, was still under control, because the Uranium Oxide rods were good until 3000 °C. It is confirmed that a very small amount of Cesium and Iodine was measured in the steam released into the atmosphere. The operators knew that the first containment on one or more of the rods was about to give. This was the “go signal” for plan B. Plan A had been to restore one of the regular cooling systems to cool the core. Why Plan A failed is unclear. One plausible explanation is that the tsunami also took away, or polluted, all the clean water needed for the regular cooling systems. The cooling water is very clean and demineralized (like distilled water). Pure water does not get activated much, so stays practically radioactive-free. Dirt or salt in the water will absorb the neutrons quicker, becoming more radioactive. This has no effect whatsoever on the core – it does not care what it is cooled by. But it makes life more difficult for the operators when they have to deal with activated (i.e. slightly radioactive) water. But Plan A failed. Cooling systems were down or clean water was unavailable. Plan B came into effect. This is what it looks like happened. In order to prevent a core meltdown, the operators started to use sea water to cool the core. The plant is safe now and will stay safe. Japan is looking at an INES Level 4 Accident: Nuclear accident with local consequences. That is bad for the company that owns the plant, but not for anyone else. Some radiation was released when the pressure vessel was vented. All radioactive isotopes from the activated steam have gone (decayed). A very small amount of Cesium was released, as well as Iodine. If you were sitting on top of the plant’s chimney when they were venting, you should probably give up smoking in order to return to your former life expectancy. The Cesium and Iodine isotopes were carried out to the sea and will never be seen again. There was some limited damage to the first containment. That means that some amounts of radioactive Cesium and Iodine were released into the cooling water, but no Uranium or other nasty stuff. (Uranium Oxide does not “dissolve” in the water.) There are facilities for treating the cooling water inside the third containment. The radioactive Cesium and Iodine will be removed and stored as radioactive waste in terminal storage. The seawater used as cooling water will be activated to some degree. Because the control rods are fully inserted, the Uranium chain reaction is not happening. That means the “main” nuclear reaction is not happening, thus not contributing to the activation. The intermediate radioactive materials (Cesium and Iodine) are also almost gone at this stage, because the Uranium decay stopped a long time ago. This further reduces the activation. The bottom line is that there will be some low-level of activation of the seawater, which will also be removed by the treatment facilities. The seawater will then be replaced over time with “normal” cooling water. The reactor core will be dismantled and transported to a processing facility, just like during a regular fuel change. Fuel rods and the entire plant will be checked for potential damage. This will take about 4-5 years. The safety systems on all Japanese plants will be upgraded to withstand a 9.0 earthquake and tsunami. I believe the most significant problem will be a prolonged power shortage. About half of Japan’s nuclear reactors will probably have to be inspected, reducing the nation’s power generating capacity by 15%. Below is the predicted path of the radioactive plume that as of now is predicted to hit the West Coast of the United States sometime Friday 3/18/2011. Note from Editor: It seems we have some controversy about Dr. Josef Oehman. One of the comments to this post (below) noted that there is another view of Dr. Oehmen. Here is a link to the article “The Strange Case of Josef Oehman” at Genius Now so you can read about him and make your own judgement about what is being said.